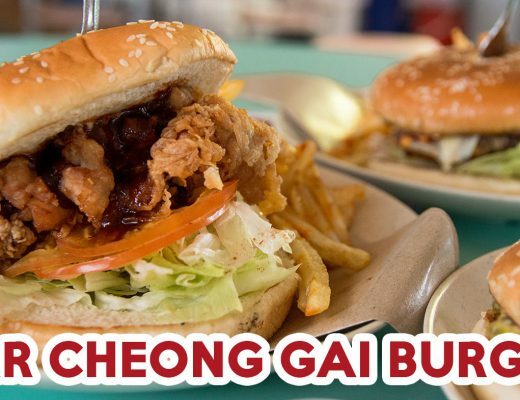 Singaporeans’ love for fast food knows no bounds. 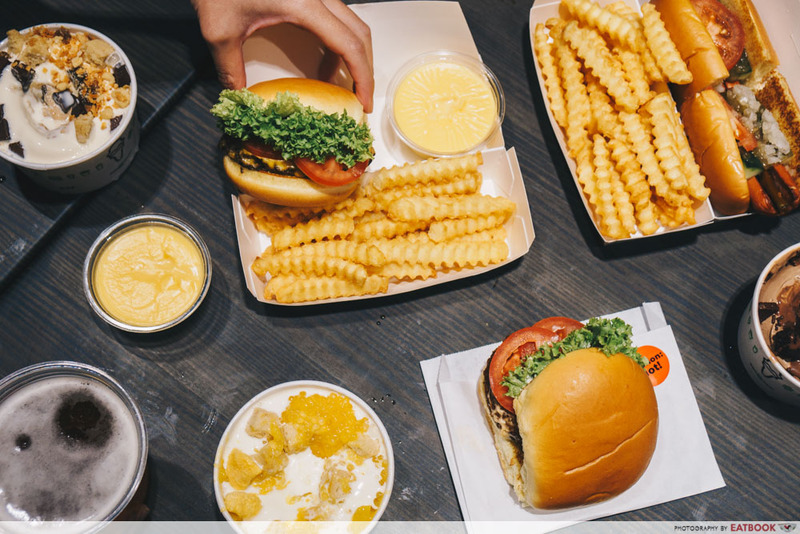 We go crazy over any new menu item from McDonald’s, get excited over any new fast food openings, and cry when they – i.e. 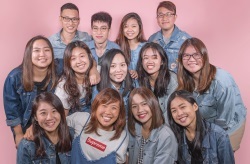 Wendy’s – leave. 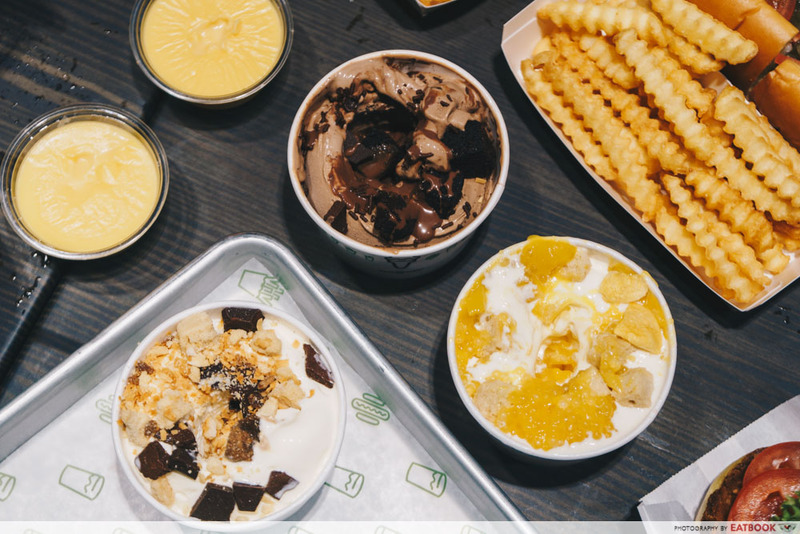 But if there’s one joint that has gotten the attention of Singaporeans everywhere, it’s definitely Shake Shack. 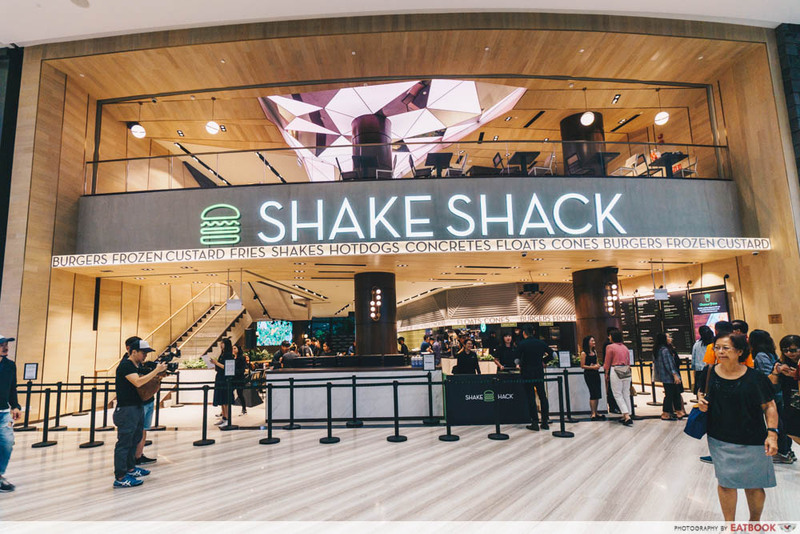 Although more of a fine casual restaurant than a fast food joint, the arrival of Shake Shack was what sparked the first wave of interest for Jewel Changi Airport. I still remember the day when word got out of their opening. Everyone – and I mean everyone – went ga-ga, joyful that one of New York’s most well-loved eateries was coming to town. 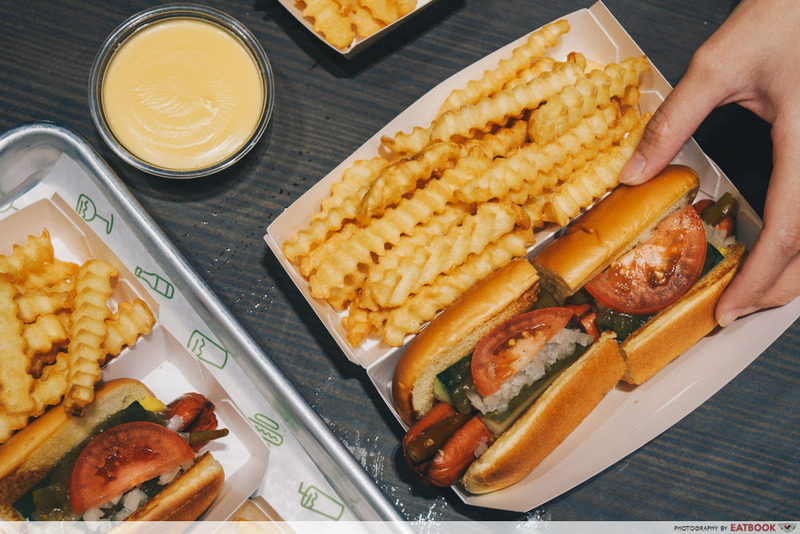 Many know Shake Shack for their burgers, but this fine casual joint actually had a humble beginning as a hot dog stand at Madison Square Park. So it was only right that we began our tasting with their Shack-cago Dog ($6.50). The portion isn’t huge, but it is certainly full of flavour. Here, an all-natural beef hot dog comes nestled snugly between a soft bun. What we found interesting was that the hot dog was split into half, and tucked in it was a whole sport pepper. Loaded with house-made relish, onion, cucumber, pickles, and tomatoes, before being garnished with celery salt and mustard, this simple dish provided a zesty bite. It was certainly light on the palate, and the sport pickle provided a slight kick of spice. As someone who likes her food with layers of flavour, this piece of hot dog certainly lived up to its reputation. Next up was the ShackBurger ($9.20), which is essentially a cheeseburger featuring US Angus beef patty and their signature potato buns. This wasn’t as cheesy as we expected, but their secret ShackSauce did provide a welcoming piquancy. The grounded patty had a nice texture, and was cooked evenly with a nice brown sear on the outside and a tinge of red within. 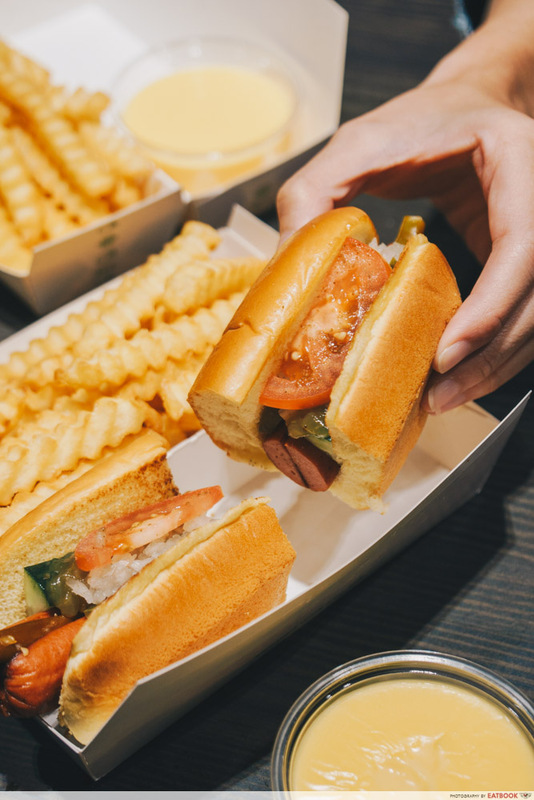 We did find it a tad thin though, so we recommend you order the Double ($12.70) instead for a meatier bite. We also really liked the potato buns, as they were really light, fluffy and buttery. It made scoffing down the burger easy too, as it was really soft. If you believe “Animals are friends, not food”, then you should order the Shroom Burger ($10.80). 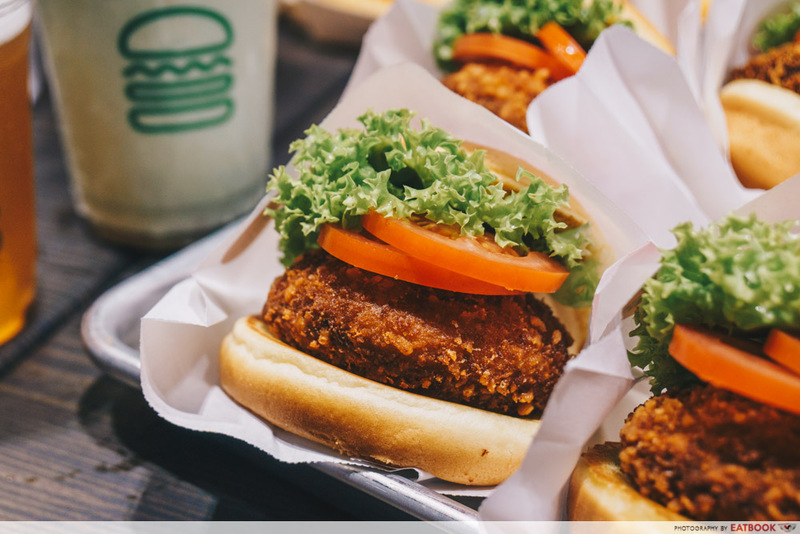 Sporting the same pillowy potato buns, this burger comprises a deep-fried portobello mushroom patty. 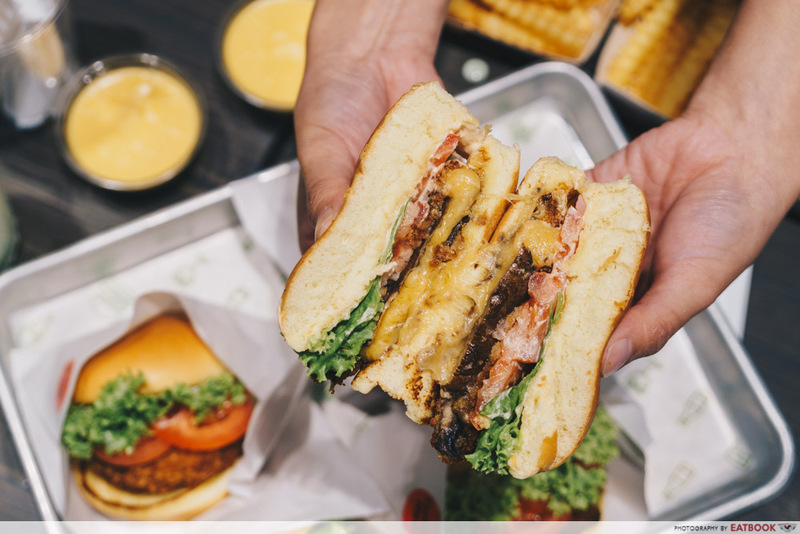 Bite into it and you will also find gooey melted cheese – a blend of Colby cheddar, Monterey Jack, and Tilsit cheese. Perhaps we waited too long, but we weren’t able to get a gush of that decadent cheesy goodness. That being said, this burger was definitely hearty and full of earthy, umami flavour. 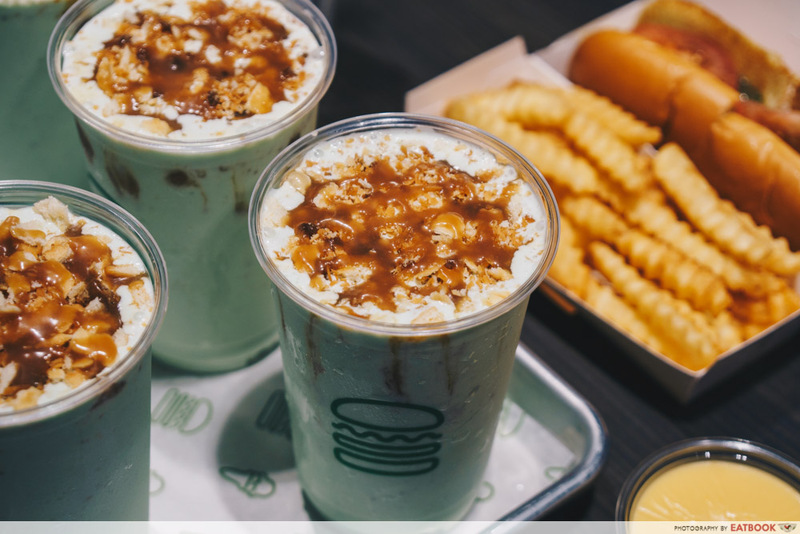 Don’t leave without sweetening up your meal, as they have Singapore-exclusive shakes and concretes. The latter is a frozen custard blend – or ice-cream if you prefer. Fans of ondeh ondeh will enjoy the Pandan Shake ($7.80). 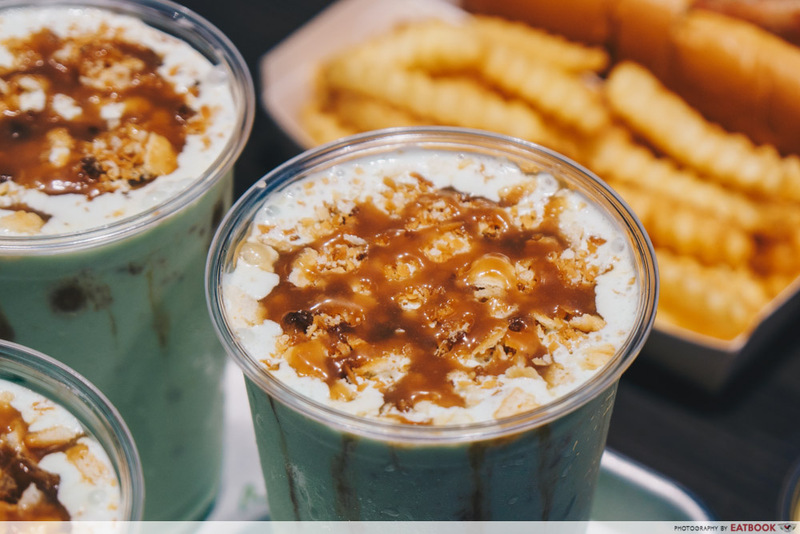 A toothsome combo of vanilla ice-cream, pandan, coconut, the green shake comes topped with gula melaka crumble. Stir it all in for a real sugar rush. Personally, while the floral pandan taste was very strong and tasty, we did find this drink a tad cloying. Expect to get jelak, even if you share this with another sweet tooth. 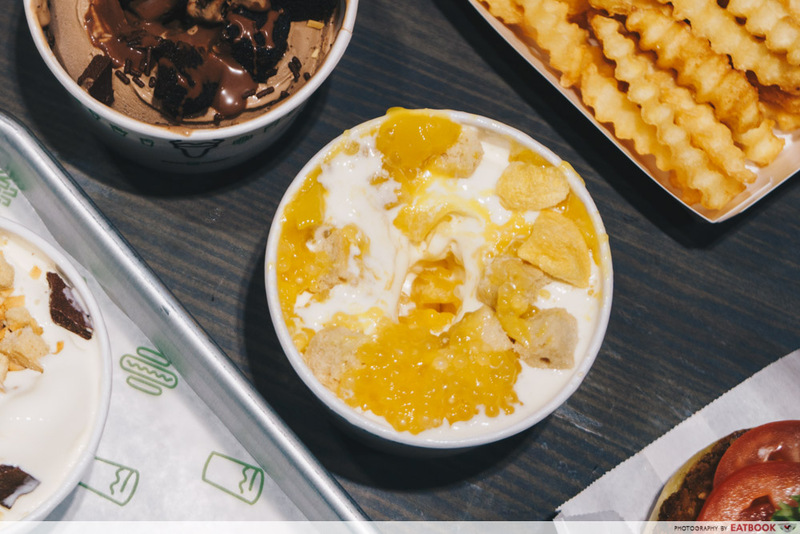 Also specially made for Singapore’s Shake Shack are the three Concretes ($7.50 for single scoop, $9.50 for double scoop): It Takes Two To Mango Concrete, Jewela Melaka Concrete, and Shack Attack Concrete. If you always order mango sago pudding at dessert joints, then we reckon It Takes Two To Mango Concrete will be an ideal choice. It comes with vanilla custard, mixed with fresh mango, sago pearls, shortbread and freeze-dried mango. I love this the most, as it was extremely refreshing and delivered bursts of fruity flavours with every spoonful. The Shack Attack on the other hand, did not bode well with me, tasting like any other ordinary chocolate dessert. The Jewela Melaka too could have offered more of that layered sweetness that palm sugar tends to offer. Don’t get me wrong, they weren’t bad, they were just not for me. 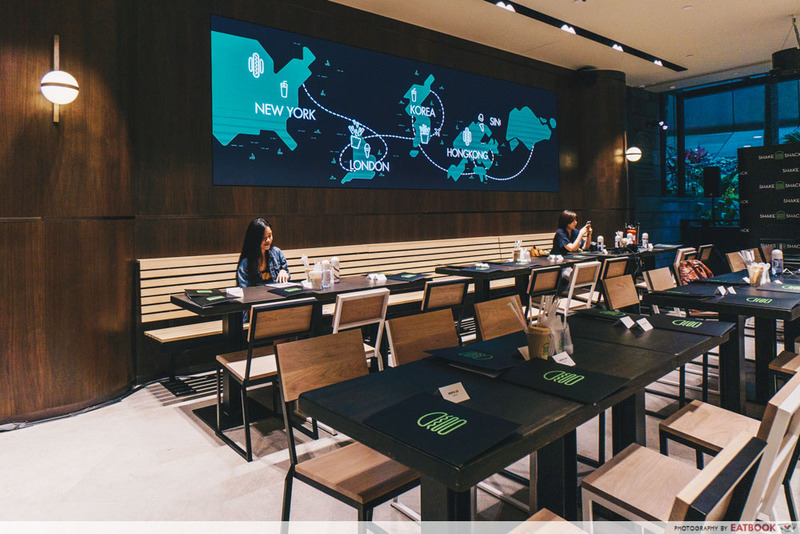 Shake Shack is the first thing you will see when you step in Jewel Changi Airport, if you enter from the Level 2 entrance. 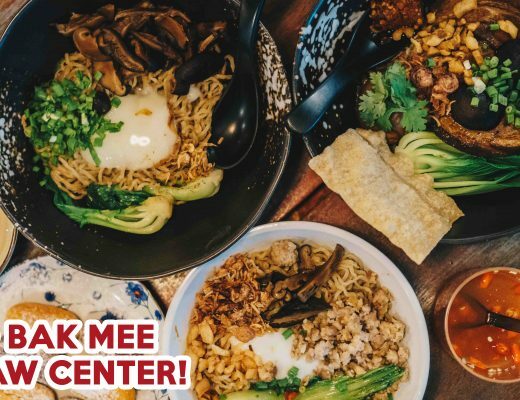 There are two storeys to accommodate us hungry Singaporeans. The design of the space is rather #aesthetics too, with booth tables and statement light fixtures hanging off the ceiling. 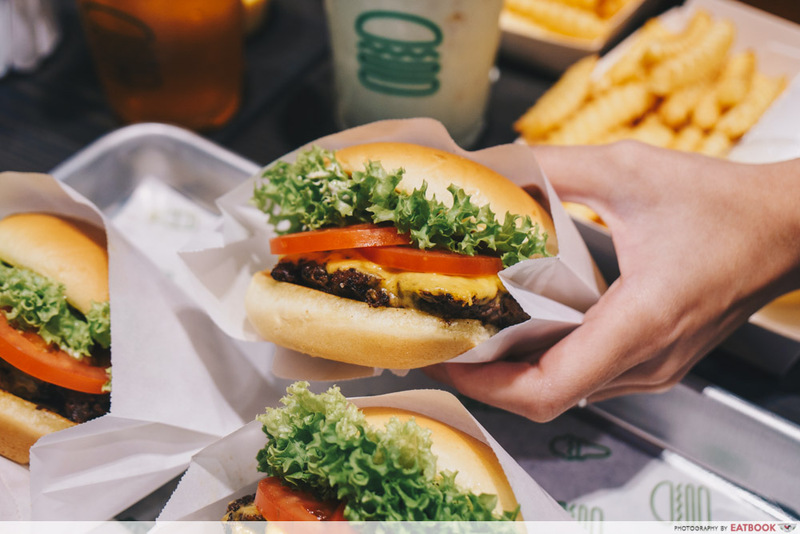 Maybe it’s because there was too much hype around it, but I do find Shake Shack’s dishes not as amazing as I thought they would be. 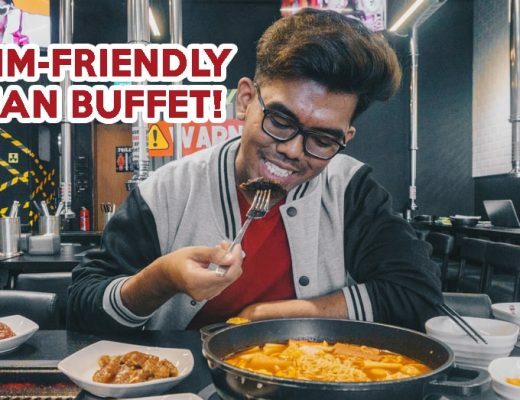 I expected more mouth-watering dishes that would make me want to return and join the public queue for seconds. However, I will definitely return and chomp on their hot dogs and burgers, but only if there’s no queuing involved.